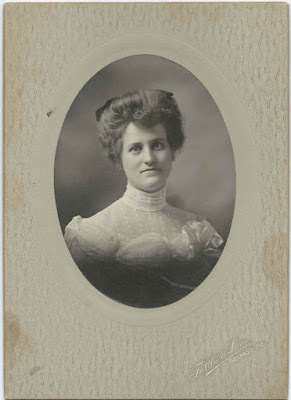 1903 graduation photograph of Gertrude Mae Johnson of Bucksport, Maine, who was in the Class of 1903 at Eastern State Normal School at Castine, Maine. 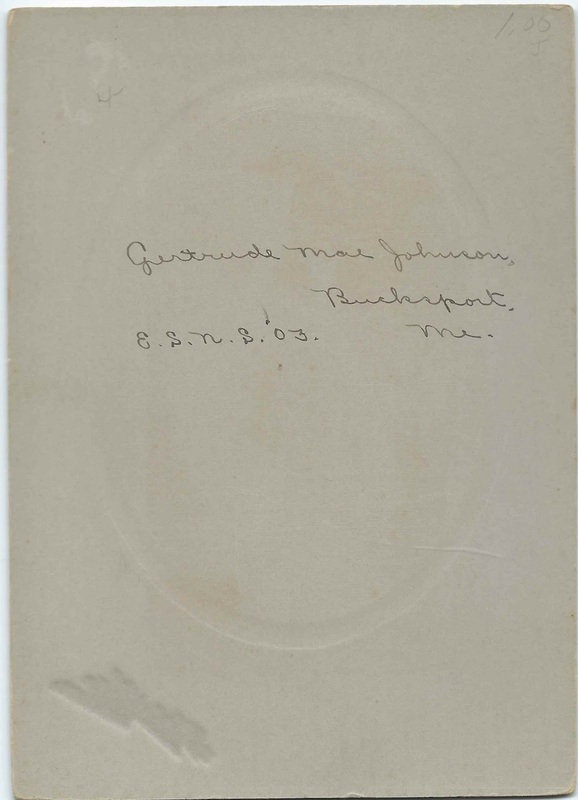 The matted photograph, taken by the studio of Tuttle & Son of Belfast, Maine, measures about 7" by 5-1/4". The photograph itself measures about 4-1/2" by 3-1/2". November 29, 1906 at Bucksport, Maine: teacher Albert White Austin, son of Elmer B. Austin and Emma Frances (White) Austin of Buckfield, Maine. Gertrude and Albert divorced. 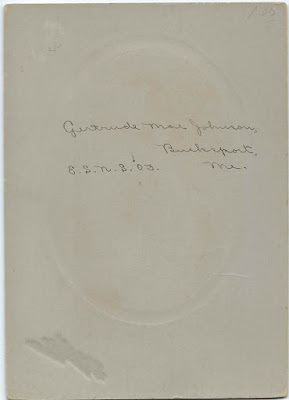 March 1, 1910 at Portsmouth, New Hampshire: Portland, Maine physician Walter Herbert Witham, son of George W. Witham and Mary E. (Cushing) Witham. Dr. Witham was divorced from his first wife, Eva Mae (Tuttle) Witham. Dr. Witham was born on Long Island, near Portland, Maine, and died there in 1930. Gertrude and Dr. Witham raised a family at Portland, Maine. Dr. Witham died in 1930 on Long Island, off Portland, Maine, where he was born; Gertrude died in 1955 at Los Angeles, California. They're buried in Evergreen Cemetery at Portland, Maine. Note that the text on the linked site for Gertrude has her birth year as 1884; fortunately, the text is accompanied by a photograph of the stone which bears the correct birth year of 1883.